Impress all of your friends at your next cookout or dinner party with this incredibly delicious and EASY Grilled Lobster Tail Recipe! Just 4 ingredients, and you'll be the superstar of the grill! If tails are frozen, place in large sealed Ziploc Bag and submerge in bowl of cold water until thawed. Mix melted Butter and Lemon Juice in small bowl. Use Basting Brush to generously brush lemon-butter mixture onto meat, then lightly sprinkle with Salt and Pepper. 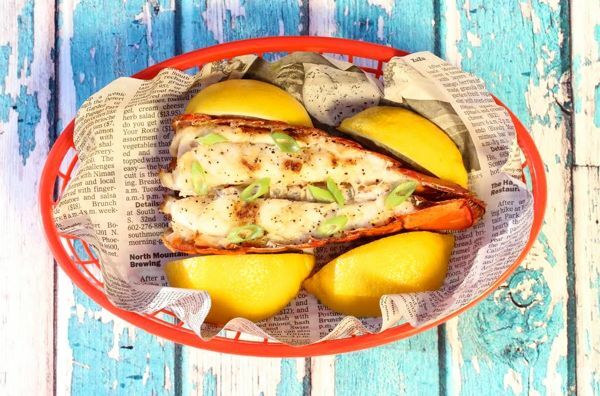 Place Lobster Tails meat-side down on grill and cook for 5-6 minutes, or until shell turns bright orange. Flip Tails onto shells (meat facing up) and again generously brush lemon-butter mixture onto meat. Lightly sprinkle with Salt and Pepper, and cook for 5 more minutes, or until Lobster meat is firm and opaque. Optional: Garnish with chopped Green Onions and serve with Lemon wedges. Enjoy! Seriously... Enjoy! !